iRobot's Roombas are already quite smart to begin with. They map out your house, figure out as best they can which areas they can reach and which areas are problematic, and the WiFi-connected models can be controlled remotely with an app or via Google Home or Alexa or IFTTT. 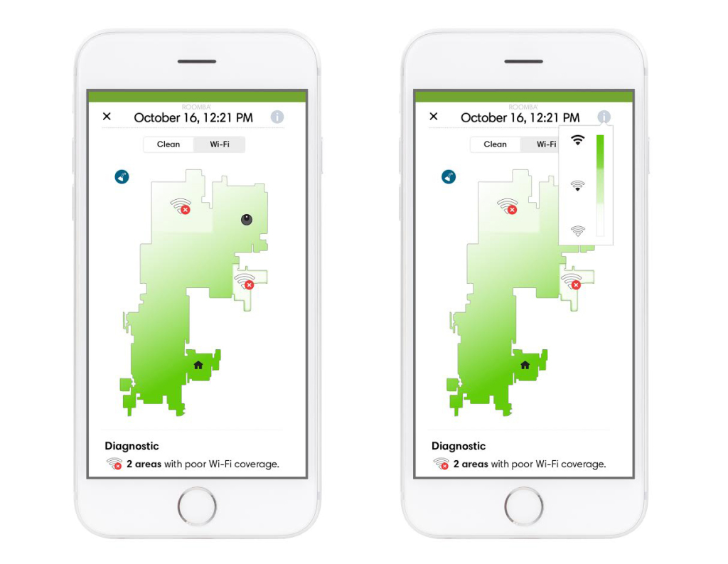 A new capability is on their horizon: a WiFi coverage map of your house. So instead of you holding your phone with a WiFi signal detection app and walking around several times to the different nooks and crannies to figure out the weak or dead spots, Roomba will do it for you. Think about it, it's already roaming the floor with a connection, it might as well do that while it cleans. According to CNET, the feature will roll out only to the Roomba 960 and 980 to start, in a new Beta program that users can sign into to signal their interest. But iRobot only initially plans to roll this out to small test groups of 100-200 users, and will expand it later when it sees fit. TechCrunch says the beta will begin in the US on January 23, so don't be alarmed if you don't see the option on your app just yet. If you're accepted in this beta, the cleaning map of your house will have a small toggle to switch to the WiFi coverage map, which will signal areas with good coverage and areas with poor or no signal. That way, if you have a mesh network or if you can move your single router around, you can do so knowing which areas to target.